How can startups and corporations work together effectively? Well, it starts with understanding Pac-Man. 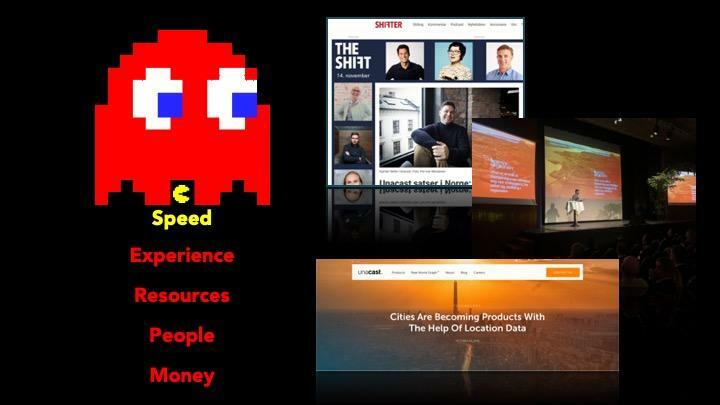 This was the title of my keynote presentation at the technology and innovation conference The Shift late last year. 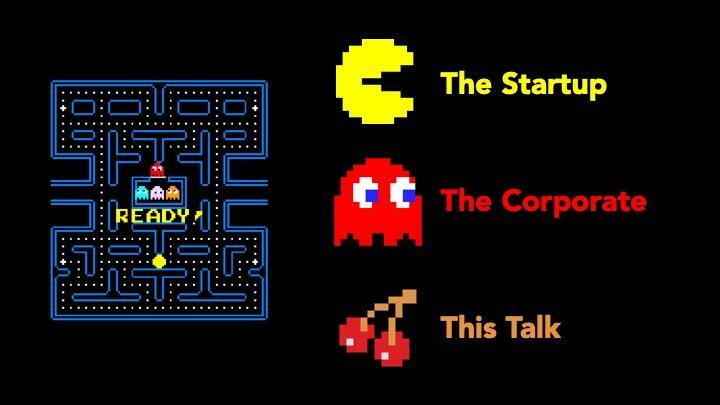 I used visual imagery from the arcade game Pac-Man to illustrate the difference between a corporate and a startup. I wanted to comment on how these two can best work together and to argue that they most often do not work well together at all even if they are in the same game. My point was straight forward. To best work together one must first understand the differences in strengths. Obviously, the corporate has many strengths, while the startup in most cases only have one. The worst-case outcome of not understanding this is that the corporate devours the startup. 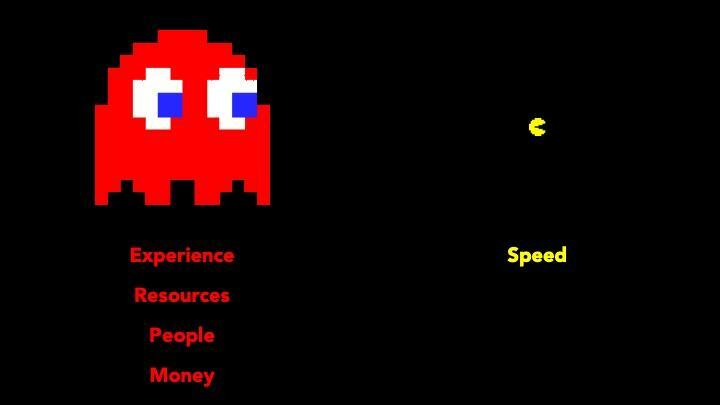 That’s why Pac-Man is running away. While it’s easy to spot the difference in size between the corporate and the startup most don’t understand the differences in strengths, and thus the corporate can end up unwittingly taking away the only real advantage the startup has: Speed (as in bringing new disruptive ideas to market quick). This is a logical chain of events as the bigger party naturally and typically would want the start up to tap into their way of working with processes and methodology. If the corporate and the startup truly understood their individual strengths it should be the opposite. The corporate should instead let the startup drive processes and methodologies, and support with their strengths: Experience, resources, people, money, and many more. Yes, the point of my keynote was straight forward, and hopefully easy to theoretically grasp, but I am well aware that this is much harder to actually implement. Theory and practice are not always friendly with each other. To take a page out of our own book, or rather presentation, in late 2018 we got to test our own theories and actually implement these in a partnership with Telia - a global telecom company with over 20.000 employees. Unacast has 40. In our 2018 Series B capital raise, Telia joined the round as an investor - for two reasons. Similar to their previous investment in Spotify they were motivated by both the financial upside and also the opportunity to find operational synergies. This is not known to many (yet), but Telia has built a robust new revenue arm around data and crowd insights and it is growing fast. By understanding aggregated and anonymous data from phones that ping cell-towers Telia is able to offer unprecedented insights around crowd movements in society over time This is fundamentally a game-changer and potentially a catalyst for everything from building better cities, improving citizens way of life, to optimizing transportation. As Telia’s opportunities around crowd insights grew so did their business need to deliver these insights to more customers and more demanding customers, with higher precision, higher quality, higher transparency, and faster. And as it happens, this is exactly what Unacast does every single day as a leading location data company in the US. But, for Telia to get value from Unacast we needed to externalize our tech platform and adapt it to cell-tower data. So, post the investment, we set up a joint project, and this is where Telia proved to us and the startup ecosystem that they get it. They get how to form agile and result-orientated projects where both parties can play on their strengths. They get how a modern corporate can successfully work with a smaller, but innovative, startup. Now, six months later, I’m happy and proud to say that we have produced ground-breaking work together that is ready to go into production. We have disrupted how to combine cutting-edge location technology with massive amounts of cell-tower data to launch higher precision, higher quality, higher transparency, and faster insights products than previously available. 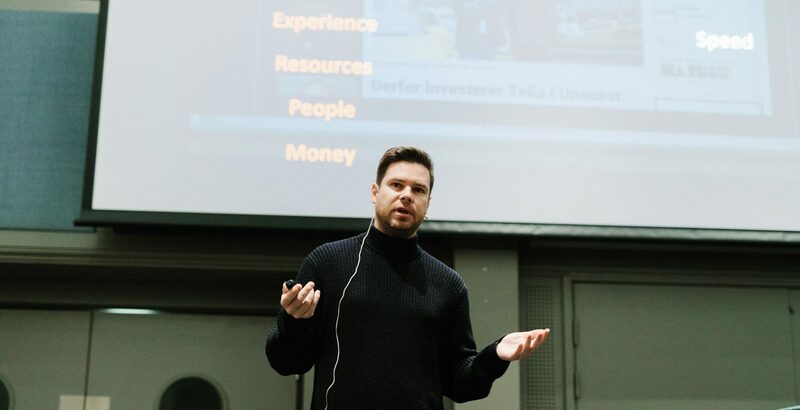 On a more knowledge-based level we have as a startup learned a lot from working with a big corporate like Telia, especially from their industry domain expertise within cell-tower based products. I would go so far as to say it has fundamentally changed our company’s DNA. And, while I can’t speak for Telia, I would argue they too have learned something from us. And one example is their newfound love of putting their technology up into the cloud, even experimenting with the same cloud provider as us – Google Cloud Platform. To summarize: We have created new products and new insights that can be commercialized, and both parties have come out stronger and wiser on the other side of the project. High scores all around. After several cautionary tales in Norway over the last years of corporates not getting it right when cooperating with startups, it was so good to experience an example of the opposite. Even better, as the project leader I was able to experience it up close and personal and also to benefit directly from the immense amounts of energy that is released when a corporate and a startup understand how to maximize each other strengths. Other corporates should learn from this – because right now Telia has an advantage over others when it comes to these types of collaborations. And I’m sure they’ll take advantage of it. And Pac-Man - you can stop running away now.